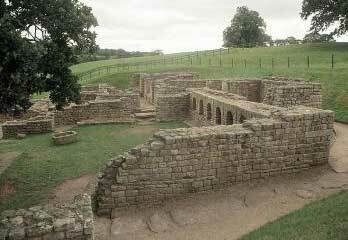 Built to guard the Roman bridge over the River North Tyne, Chesters Fort was one of a series of permanent troop bases added during the construction of Hadrians Wall. It was in use for nearly three centuries, and its six-acre area housed a cavalry regiment of around 500 men. There is much to see on the ground: all four principal gateways are well preserved, with short lengths of Wall adjoining them. The entire foundations of the headquarters building are visible, with a courtyard, hall, regimental temple and strongroom clearly laid out. The commandant’s house is the most luxurious building in the fort.